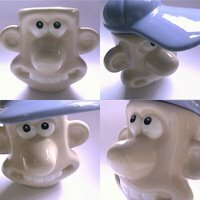 Wallace loves cheese and (apparently) the studio Aardman Animations loves not only chickens, but also soft-boiled eggs. 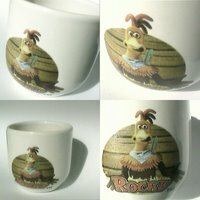 Free-range or not, eggs are more than welcome in the generous selection of cups inspired in their characters that are available on the market. 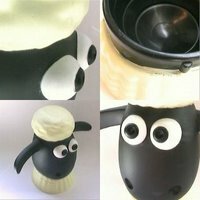 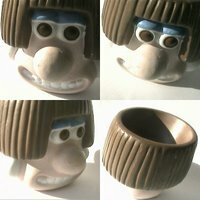 Nick Park fans are happy and so should be egg cup collectors. 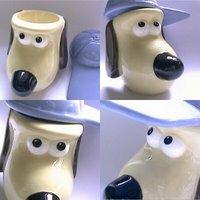 Known details: 1) Wallace head with movable blue cap, made in China for Enesco's Border Fine Arts, designed by Paul Cardew, "The Curse of the Were-Rabbit" model [eggcup4879]; 2) Gromit head with movable blue cap, made in China for Enesco's Border Fine Arts, designed by Paul Cardew, "The Curse of the Were-Rabbit" model [eggcup4880]; 3) Rocky Rhodes bucket, produced in 2000, from a series of eight egg cups with "Chicken run" characters offered by a British eggs producer [eggcup1838]; 4) Wendolene head, offered by Ty-phoo tea [eggcup1689]; 5) plastic, Shaun head, made in China for The Boots Company PLC, first sold in 1989 [eggcup1836].